Let me start by saying I made these. I made 13 of them to be exact. As I was plating them my husband walked by and said "Oh my Gosh how adorable are those?" Yes - they are absolutely adorable. They are also now in the "someone has lost their damn mind" category! They're tiny! One bite! I made thirteen and decided there had to be an easier way. At which point the husband walked past AGAIN and said "Oh my gosh those are adorable too! But I thought you wanted easier? Isn't it as much trouble to cut out all those little circles? And your tying the cucumber slices???" anyway......there really is no moral to this story. This appetizer was delicious - the dinner guests for February dinner @Tate's gobbled them all right up. They are ridiculously cute on the little tiny serving platter aren't they? slice the cucumbers very thinly. i used my potato peeler since my mandolin is so temperamental. leave a little skin - they're prettier that way. lay the slices out on paper towels on a large baking sheet. sprinkle a bit of salt all over them. set aside for 15 or 20 minutes and let the salt do it's thing. in a bowl - mix together the cream cheese, Feta, yogurt, tomatoes and dill. blot the cucumber slices to dry. add a teaspoon or so of cheese mixture to one end of a cucumber slice. lay a stem of fresh dill on top of the cheese mixture. decide you've lost your damn mind. 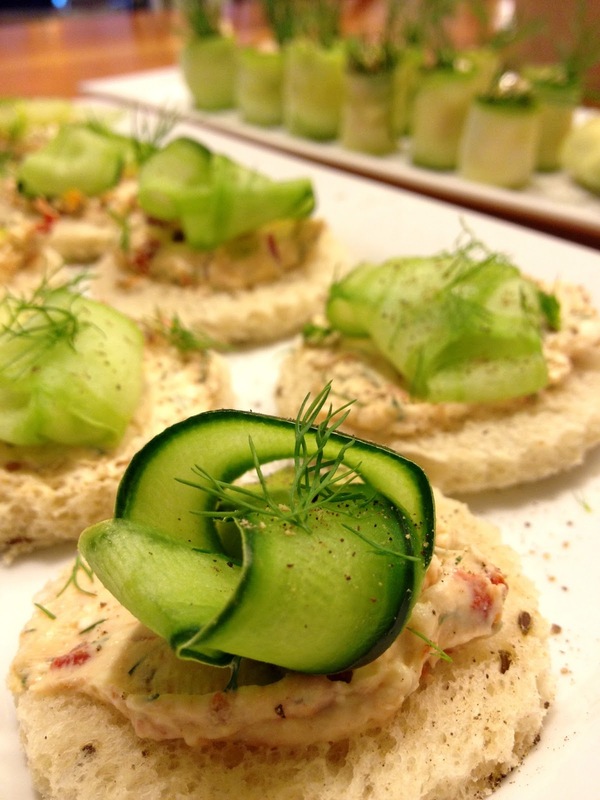 then using a cookie cutter - gather a bunch of circles from slices of Dill Rye bread. spread a tablespoon or so of the cheese mixture on each little round of bread. using all those slices of cucumber that were too skinny to make into the lovely roll - carefully tie each one into a little knot. gently place atop the cheese mixture. 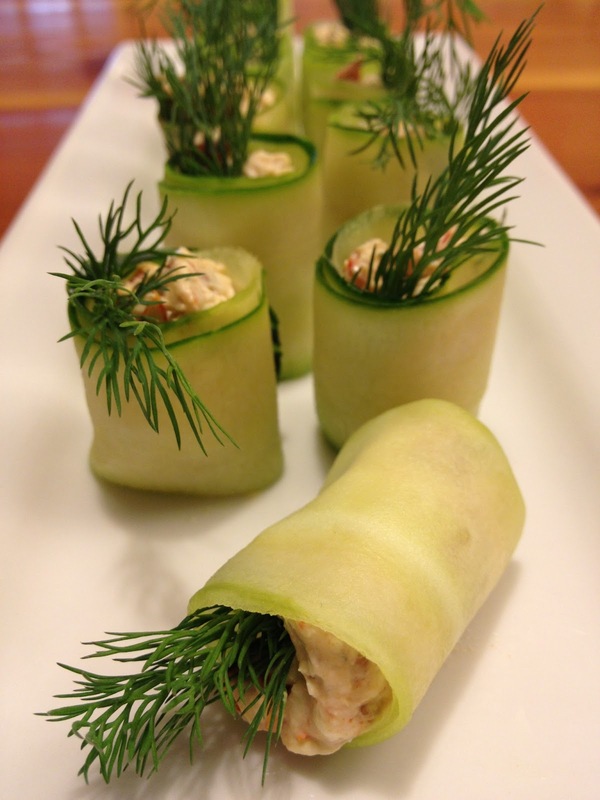 garnish with a stem of fresh dill. LOL Jacqueline - They really are quite easy to make. I promise. And tasty - just use the spread on a cracker - totally worth it.